New data and analysis from international catastrophe risk modeller, AIR Worldwide, reveals that a 1-in-100 year loss event is equivalent to an estimated $253 billion in global insured losses, an increase of roughly 8% on last year and, the trend is evident across all loss metrics. AIR has been producing these reports since 2012, and its latest edition of its ‘Global Modeled Catastrophe Losses’ report, shows that the 1% aggregate exceedance probability insured loss (or the 100-year return period loss) has been on the rise since 2012. Starting at $205.9 billion four years ago, this figure has increased to the $252.9 billion reported by the catastrophe risk modeller in its latest report. Furthermore, AIR reports that global, insured aggregate average annual losses (AAL) from catastrophes has also increased every year since 2012, rising from $59.3 billion in 2012, to $80 billion in 2016. AIR explains that as with previous editions, the 2016 report and global loss metrics are based on perils and regions currently modelled by AIR, which includes a number of new models and updates that were released during 2016. This includes the addition of a new India earthquake model, and updates to other models, such as U.S. terrorism, U.S. crop, U.S. hail, U.S. MPCI, Southeast Asia typhoon, Southeast Asia earthquake, as well as the most recent update to its industry exposure database for the U.S., India, and Southeast Asia. Interestingly, AIR also provides a breakdown of loss metrics on an insurable basis, with insurable including “all exposures eligible for insurance coverage assuming standard limits and deductibles, regardless of whether they are actually insured,” explains AIR. For 2016, where the AAL is an estimated $80 billion, the insurable loss is just more than double, at $160.2 billion, a trend that again continues across all loss metrics provided in the report. 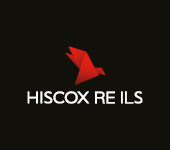 For the 1-in-100 year return period and the 250-year return period, where the insured loss is $252.9 billion and $325.3 billion, respectively, the insurable loss is a staggering $584.2 billion and $924.8 billion in 2016, respectively, explains AIR. “A large difference between insured and insurable losses indicates cases where the risk is not fully understood and society is inadequately prepared to respond. For regions and perils covered by existing catastrophe models, this difference presents not only potential business growth opportunities for the insurance industry to offer essential protection to vulnerable home and business owners, but a responsibility to act,” says AIR. The disparity between estimated insured losses and insurable losses highlights an opportunity for the insurance, reinsurance, and insurance-linked securities (ILS) space, to create solutions that increase insurance penetration in both emerging and advanced markets, much like the global protection gap (being the difference between insured and economic losses post-event). Perhaps unsurprisingly, and as highlighted by the table below provided by AIR, emerging regions such as Asia and Latin America show greater disparity between insured and insurable loss metrics, especially when it comes to the 1-in-100 year and 1-in-250 year return period. The situation is very similar and just as damaging when considering the global protection gap, which AIR again highlights in the table below. 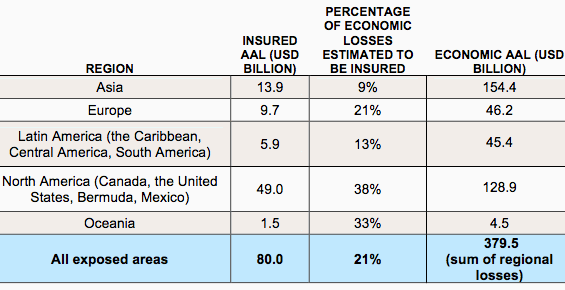 As the table highlights, emerging markets such as Asia and Latin America that typically have dangerously low insurance penetration rates, and are also very susceptible to a range of natural catastrophes, see a significantly lower level of insured losses as a percentage of total economic losses when disaster strikes. “In situations where insurance is not feasible or cannot be offered at an affordable price, catastrophe modeling can be used to inform emergency management, hazard mitigation, public disaster financing, risk pooling, and other government-led risk and loss mitigation initiatives to enhance global resilience,” explains AIR. By peril, tropical cyclone, severe storm, crop, and earthquake exposures contribute the most to global insured AAL, at 30%, 29%, 17%, and 15%, respectively, explains AIR. There’s clearly an opportunity for insurers, reinsurers, and ILS players to do more to provide the right solutions for businesses, governments, and individuals in both emerging and more advanced markets. While the inclusion of new perils and model updates, along with the rising asset values and higher concentration of risks, owing to urbanisation and migration in some parts of the world, contributes to the increased loss metrics year-on-year, there is clearly a lack of adequate risk transfer utilisation in emerging, and advanced markets, across a range of peril regions. “Examination of economic and insured losses reveals how wide the protection gap is and how sizable losses are for societies after a catastrophe, which can inform risk mitigation, public risk financing, and emergency management to enhance global resilience and better prepare society for the ultimate costs,” said AIR. You can download AIR’s new report here.